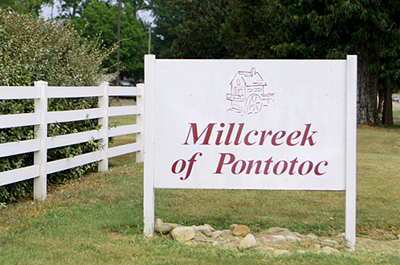 Millcreek of Pontotoc's Psychiatric Treatment Facility (PRTF) provides intensive, clinically sophisticated, therapeutic programs for children and adolescents utilizing an interdisciplinary approach. Our treatment programs serves young people between the ages of 6-18 who experience severe emotional and behavioral disorders not effectively treated in a less restrictive setting. Patient may be experiencing issues such as clinical depression, attention challenges, substance abuse/dependency, post-traumatic stress disorder, borderline personality features, bipolar symptoms, and other associated psycho-behavioral problems. The goal of our treatment is to allow for our patients' successful reintegration into their homes and local communities. The treatment programs include private schooling, therapeutic recreational activities, and individual, family, and group psychotherapy. Additionally, all patients have constant access to medical services with 24 hour nursing care and full-time, on-site psychiatric services. Millcreek School offers educational programming for children primarily between the ages of 6-18 with special needs. With locations in Pontotoc, Batesville, Starkville, Greenville, and Ripley, these five sites are licensed and accredited as special non-public schools by the Mississippi State Department of Education. Testing, Individual Education Plans, and eligibility/screening services are available through the school. The school program stresses the importance of the individual and the belief that each student must be recognized as unique. A specific course of instruction is prescribed in a stimulating environment and designed to develop the whole child to his or her fullest potential intellectually, socially, emotionally, and physically. A specialized curriculum, coordinated with the Mississippi State Department of Education, is intended to prepare students for return to a community setting. The Millcreek Day Treatment Program is designed to provide assessment and treatment of emotionally disabled children (6-12) and adolescents (13-21) who could benefit from more intense services than outpatient, but do not require 24 hour inpatient treatment. The emphasis of this structured intensive outpatient treatment is to treat the educational and emotional needs of our students in the least restrictive setting with a goal of reintegration of the child/adolescent back into the community. Treatment combines behavioral and psychodynamic principles and focuses on working with the patient, family, and community to create a thorough understanding of the patient's illness and provide the tools to reduce/eliminate the need for hospitalization. Educational opportunities are paired with therapy to help patients thrive in the less restrictive environment. Day Treatment sites include Pontotoc, Batesville, Starkville, and Greenville. Each site has a coverage area that, when paired covers most of North Mississippi. Transportation to and from our facilities is available on routes that canvas each coverage area.